Take document signing and archiving to the next level with Visma Sign. Visma Sign scales and adapts to your needs. You can use it as an efficient digital signature service, handle all of your organisation’s documents digitally and archive them reliably. You can also create electronic forms for your company, all at once. You no longer need to deal with paper documents. 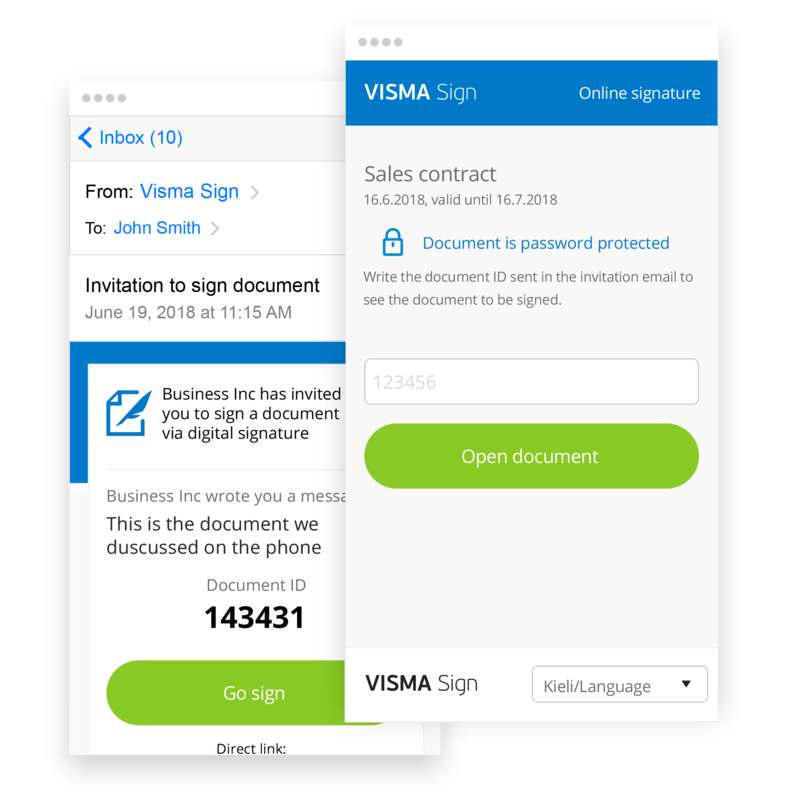 of the invitations sent via Visma Sign are signed within 24 hours. Over 98 % of all documents sent are signed. If you need to sign a document, it is easier to sign it digitally. Visma Sign is perfect for signing commercial contracts and agreements, work contracts, meeting minutes, mandates and other legally binding contracts. Upload and send a document to be signed. You can invite people to sign via email and/or an SMS. You can also integrate the service to be part of your electronic business processes. Visma Sign checks the signers’ identities with either online banking codes or MobileIDs. Each person can sign the document easily and quickly. In addition, each party automatically receives a copy of the document. Make your business more efficient with Visma Sign or make digital signing a selling point for your company’s customer experience. You can integrate Visma Sign into your current CRM or ERP solution or your current digital service process. Have you received an invitation to sign? You have received an invitation to your email to sign a document digitally. Digitally signed documents are as legally binding as those written with pen and paper. Signing a document is completely free for you. We have collected the user tips for Visma Sign into one place. 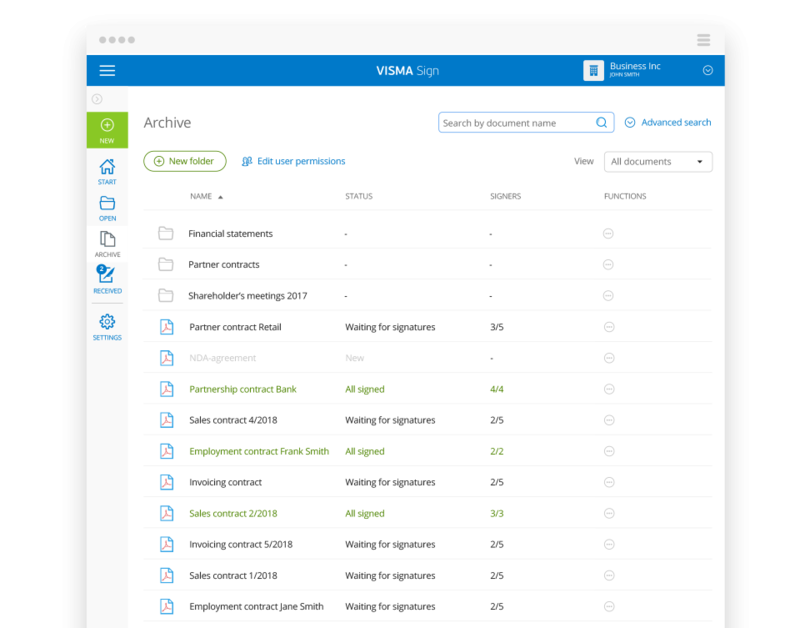 Read about accessing the service, what you should do next and how you can make the most of Visma Sign within your company. We changed our traditional insurance notice handling into a digital process. Our two-week processing time changed to one day. Expenses dropped to 5% of the cost of the paper process while reducing errors. But the most important thing was that our customers have experienced Visma Sign to be easy to use. Visma Sign does not use fixed monthly fees or starting fees. You only pay for what you use. The users of Visma Sign can sign documents in Finland, Norway, Sweden and Denmark. Contact us or try the service right away. Setting up your account will only take 5 minutes.